2016 Herald Classic 125. Picture credits - Herald. Submit more pictures. 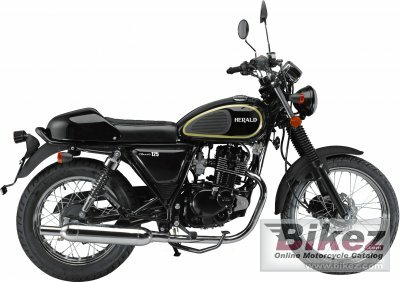 A reliable bike with a Suzuki derived engine, the Classic 125 features spoked wheels, a rear drum brake and a retro-styled, teardrop shaped, fuel tank. With its quality build, low running costs and competitive pricing it�s easy to see why the Classic 125 has enjoyed such rave reviews. Ask questions Join the 16 Herald Classic 125 discussion group or the general Herald discussion group. Bikez has reestablished Bikez.info motorcycle web shop overview. Here we present the major online shopping possibilities for motorcycle parts, gear and accessories. This includes customizing and insurance. Search and compare products and prices. Try our 2016 Herald Classic 125 discussion forum if you have questions or comments. Information about any technical issue is always welcome.